Police in St. Louis have stepped up patrols after six churches in predominantly black neighborhoods were set on fire this month. As St. Louis Public Radio has reported, the cases, which are being investigated by local and federal authorities, are being treated as arson. St. Louis Public Radio reports that the fires have been started when the churches are empty and when the "arsonist lit exterior doors on fire." "But Dotson said investigators have yet to confirm that race was the motive. If race or religion proves to be the reason, he said, police will seek to have the incidents prosecuted as hate crimes." KPLR-TV reports that authorities are offering a $4,000 reward for information that leads to the suspects. 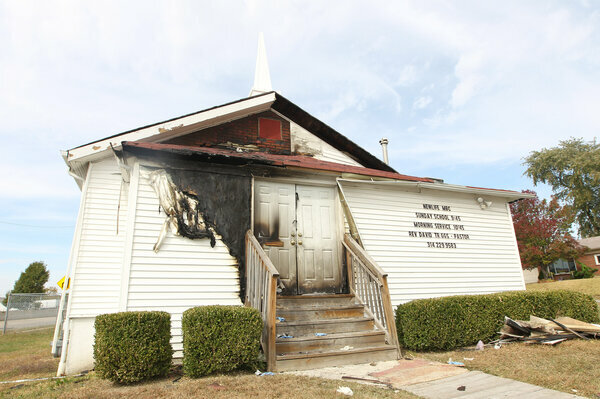 "In statements Tuesday, Missouri Governor Jay Nixon and Attorney General Chris Koster condemned the recent church fires in north St. Louis City and County. "Koster said, &apos;A house of worship should be a place of peace and refuge. These targeted acts of arson strike at the heart of St. Louis by attacking its sanctuaries. The perpetrators must be found and brought to justice.&apos;"